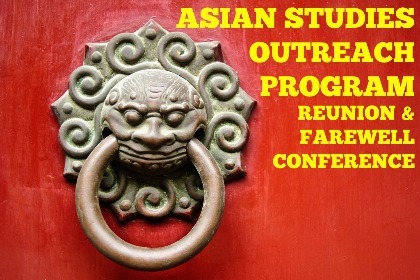 The Asian Studies Outreach Program, after in operation for 22 years, will conclude its final year with a daylong conference that celebrates the legacy of the Asian Studies Outreach Program and current programs that promote Asian Studies. Dr. Juefei Wang will deliver the first keynote speech outlining the history and success of the Asian Studies Outreach Program. Mr. Jeff Wang, Advisor to the President of the Asia Society, will be the second keynote and address new resources for teaching about Asia in schools. The Conference will conclude with a celebration of music and dance. In addition to the the Farewell Confernece, the Asian Studies Outreach Program is collecting "Top Five" stories from alumni on their top five memories of the program. The submissions will be shared on the Asian Studies Outreach Program Facebook page until June 1. After June 1, all the stories will be assembled into a book that will be housed within the College of Education and Social Services.